North Korea’s leader also emphasized that his relationship with Trump remained positive. 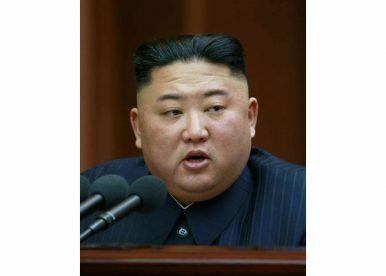 In a speech last week to the Supreme People’s Assembly (SPA), North Korea’s analog of a parliament, Kim Jong Un outlined his view on the state of ongoing talks between the United States and his country and a range of other issues. The speech marked Kim’s first public comments on the diplomatic process with Washington since his second summit meeting with U.S. President Donald J. Trump at the end of February ended without agreement. Kim’s broad message on the process with the United States remained consistent with what he had said during his New Year’s Day address: that the onus remains on Washington change its approach toward talks with North Korea. He left open the prospects for diplomacy, saying that a change in the American approach could lead to a third summit. “If the U.S. adopts a correct posture and comes forward for the third DPRK-U. S. summit with a certain methodology that can be shared with us, we can think of holding one more talk,” Kim said. “Anyway, we will wait for a bold decision from the U.S. with patience till the end of this year, but I think it will definitely be difficult to get such a good opportunity as the previous summit,” he added, underscoring a deadline of sorts for the Trump administration. The North Korean leader was unequivocal that sanctions would not alter his strategic calculus. He told the SPA that sanctions must “be weathered and foiled,” echoing comments he’d made days earlier during his report to the 7th Central Committee of the Workers’ Party of Korea. During that speech, he said that North Korea needed to increase its self-reliance and “deal a telling blow to hostile forces” seeking to apply sanctions pressure. Kim did mention the June 12 Singapore declaration, concluded last year between him and Trump. He said that the United States had continue its “hostile policy” contrary to the spirit of that agreement. North Korea uses the phrase “hostile policy” to reference any range of behaviors and actions by the United States. In Kim’s speech, three core examples of this policy were the United States’ refusal to grant sanctions relief, its continuation of modified military exercises with South Korea, and a recent U.S. missile defense test against an intercontinental-range ballistic missile-class target. The United States is “is still shunning the withdrawal of its hostile policy, the fundamental way of establishing the new DPRK-U.S. relations, and miscalculating that it can bring us to our knees if it puts maximum pressure on us,” Kim said. Despite offering a critical view of the state of U.S.-North Korea diplomacy, Kim emphasized that his personal relationship with Trump remained positive. “As President Trump keeps saying, the personal ties between me and him are not hostile like the relations between the two countries and we still maintain good relations, as to be able to exchange letters asking about health anytime if we want,” he noted. The U.S. president responded to Kim’s statement on Twitter. “I agree with Kim Jong Un of North Korea that our personal relationship remains very good, perhaps the term excellent would be even more accurate, and that a third Summit would be good in that we fully understand where we each stand,” he said. “I look forward to the day, which could be soon, when Nuclear Weapons and Sanctions can be removed, and then watching North Korea become one of the most successful nations of the World,” Trump added. The meeting will build on the Singapore declaration between the two sides, agreed to in June 2018.